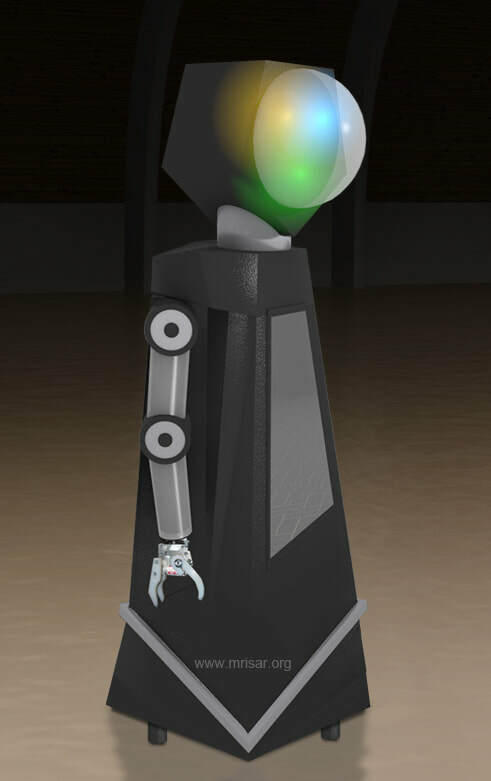 Deven II is a demonstration robot designed to maneuver around a room and speak and respond to voice commands. Deven II's exterior opens for educational viewing of its interior which relates to STEM education. It is approximately 6‘ tall. It is powered by a non-spillable gel cell battery at 12 V DC. 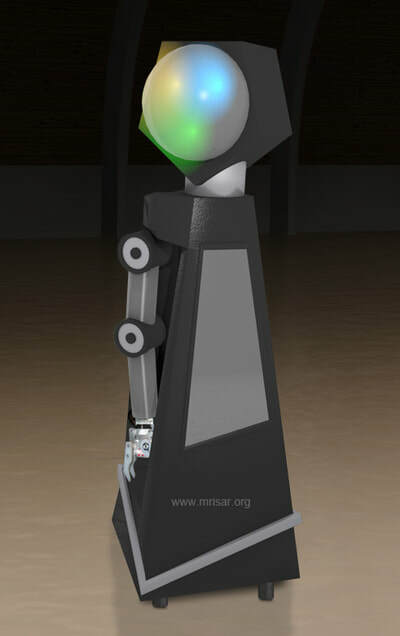 It is one of a number of robots being developed for museum demonstrations and exhibit floor use. It is a large robot intended for supervised demonstrations while in demonstration mode and for visitor use while in the enclosed activity area that is included. For exhibit floor use by museum visitors it comes with a 10’ x 10’ activity area and railing mounted control panels included in the price. 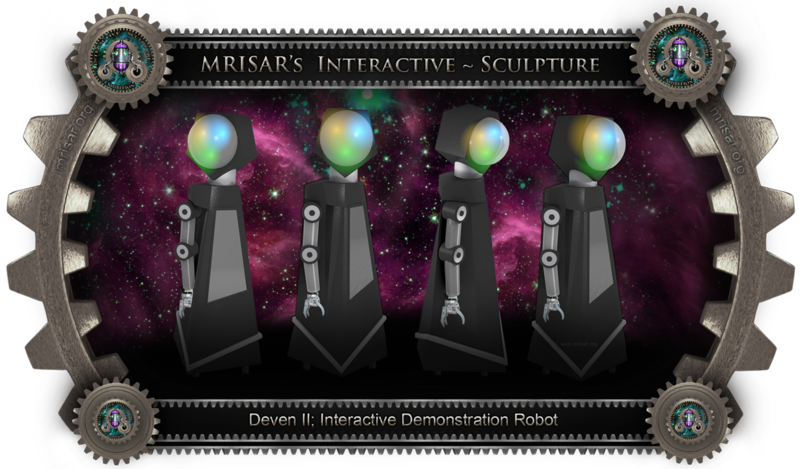 The original Deven prototype has entertained students for since 1991. The Deven II version we are offering is also durable, but features many technological improvements. 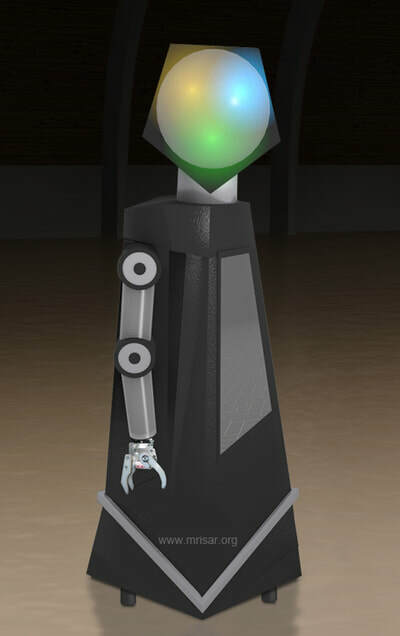 If your organization is looking for an unique, friendly human relations technological device that is large enough to not land under foot and durable enough to stand public interaction, Deven II could be the answer. Deven II uses IR. sound, visible spectrum detectors, ultrasonic and tactile sensors to interpret its surroundings. Its speech is impressed on a chip and is user definable for numerous applications. Deven II can understand up to 40 “speaker dependent” spoken words once voice patterns are programmed into it. The mobile base will work well on any relatively flat surface. 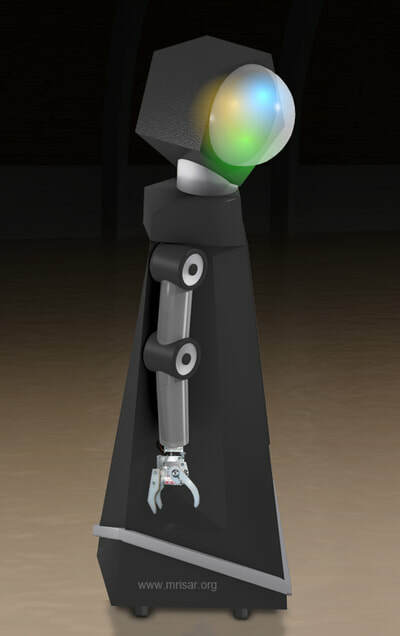 It has a five range of motion, 3 finger electromechanical arm that can be used to pick up objects and gesture gracefully. ​Deven II comes with a charger, remote control unit, 10’ x 10’ activity area railing and a set of basic demonstration materials and a maintenance manual. Deven II is available in a wide variety of colors. Note: Mobile robots are for supervised use only unless they are displayed in the activity area.